Four-eyed Fishes are found along coastlines and associated tidal streams and marshes from Oaxaca in southern Mexico to Brazil. Although sometimes encountered well inland and in the ocean, they spend the majority of their time in brackish water. Three species have been described, with Anableps anableps being most commonly available in the trade. Unique among all fishes, the eye is divided into two parts by a horizontal band of opaque tissue. The fish spends nearly all of its time at the surface of the water, positioned so that this dividing band of tissue is at the interface of the air and water. The upper portion of the eye then scans the air for prey and predators, while the lower half does the same below the water. Four-eyed Fishes are best maintained in partially filled aquariums. In this manner, you will more easily be able to observe their unique habits and lifestyle. They are adapted to life in shallow water, so the aquarium’s length and width is far more important than its depth. 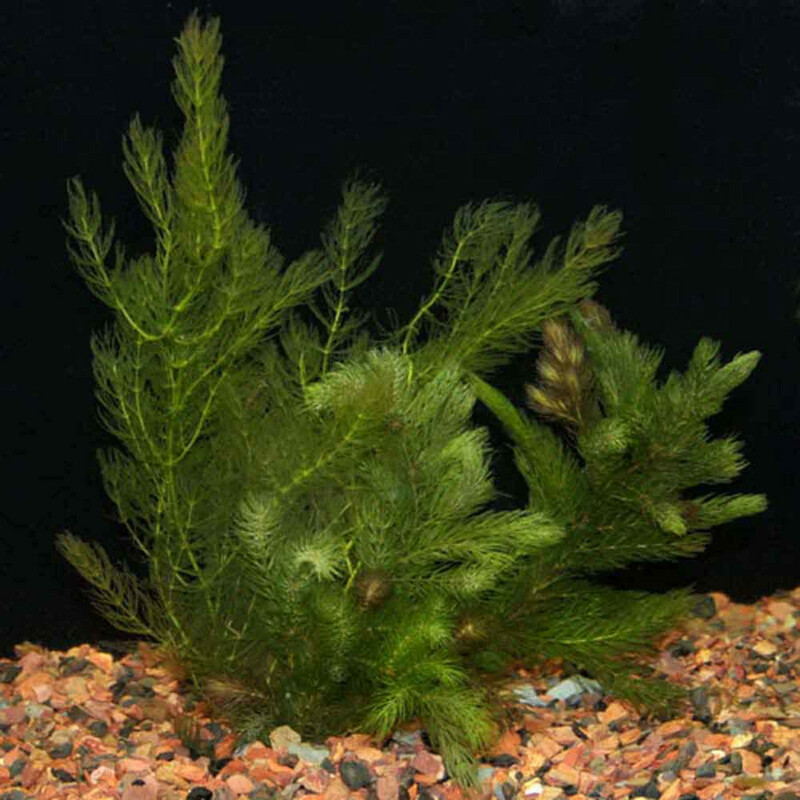 Floating plants, or rocks that rise nearly to the water’s surface, should be provided as resting sites. Four-eyed Fishes are always on the move, and therefore require an aquarium with a good deal of surface area. They are quite aware of their environment, including the area outside the aquarium, and are amazingly responsive; many folks consider them more of a “pet” than a display animal. However, primed as they are to expect attacks from both above and below, Four-eyed Fishes can also be quite skittish in captivity, and are prone to injuring themselves when startled. For this reason, they should be approached slowly and lights should never be suddenly turned on if the room is in complete darkness. Typical brackish water aquarium conditions suit them well, but temperatures should be kept on the warm side – 83-86 F is ideal. Four-eyed Fishes have evolved to fit a very specific niche within their environments, and in that way can exploit a food source largely unavailable to competing species – terrestrial (land-dwelling) insects. Most often insects are captured as they alight on the water’s surface, but Four-eyed Fishes are also surprisingly good at leaping and snapping flies and moths from the air. Four-eyed Fishes definitely prefer live foods… they will accept frozen items (clam, shrimp, etc. ), but they seem to thrive best when provided with a more natural diet. When fed live insects, the responses of those I’ve kept left no doubt in my mind as to their value as a food source. Crickets, newly molted mealworms, spiders, moths, grasshoppers, flies, beetles and others were attacked with vigor – often I felt as though I were keeping frogs, not fishes! As wild specimens sometimes enter salt water environments, I occasionally provide captives with marine shrimps and small shiners. I’ll cover breeding in the future. Until then, please write in with your questions and comments. Thanks, Frank Indiviglio. Read more about this fish’s natural history here and see them in action in this video. For more on brackish water aquariums, please see Mudskippers and Algae and Plants for Brackish Aquariums. Next: For the Health of Your Reef Aquarium – Dip it! This is an oddity. Other oddities i’ve come across are the lung fish and cave fish. The lung fish has the ability to make cocoon itself in a protective layer and can stay that way without water for up to 5 years. 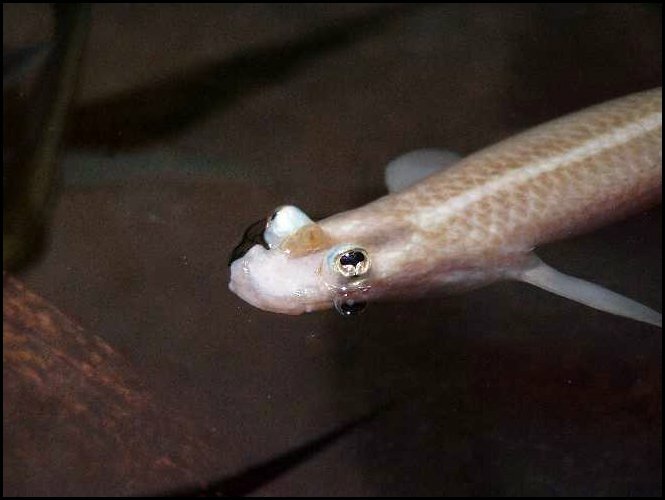 The cave fish, being found in caves with no light, has evolved to have no eyes and depends on smell and vibrations in the water. I saw these at my local pet store, and I’m thinking of keeping one. The store keeper said that these fish should have some land, as they like to come out of water occasionally. I thought only mudskippers and lungfish could do that though! Interesting, Enzo, thanks – I’ve known them to rest of submerged branches at the surface, but have not read that they will leave the water; worht looking into. I saw him rest on land a few times, but not fully our of water.